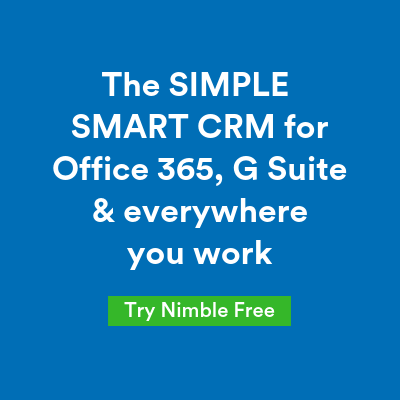 This is part of an ongoing series, “8 Unedited Minutes”, that Nimble is providing to help sales and marketing professionals solve problems, create opportunities and start conversations that can lead to collaboration. 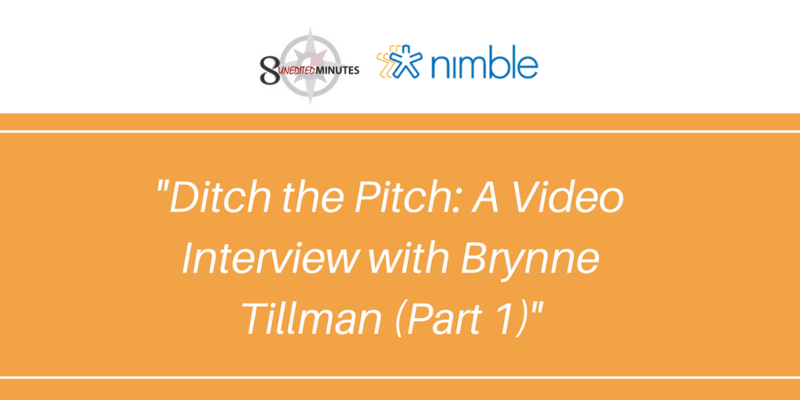 Each episode features an expert from the Nimble community sharing real world experience to give you actionable ideas to use right after you view the interview. Each blog post is meant to be a conversation starter! Reach out to the person being interviewed to connect, suggest a friend to be interviewed or suggest a topic that you would like to hear about in a future interview! 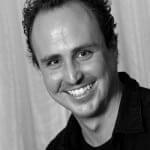 When it comes to sales and marketing many people separate the online world of social media from the offline world of “traditional” sales and marketing. The two worlds aren’t that far apart in many respects; it’s more about the perception that they are. Recently I spoke with Brynne Tillman about the problems people create for themselves online that lead to lack of results offline – and what we can do to create success instead. Brynne describes herself as “A lifelong sales person and sales trainer gone social”. “Gone social” grabbed my attention. Is there a gap between the two worlds? If so, what is this “gap” that we need to cross when we “go social”? According to Brynne there IS a gap; although it’s very, very narrow and her answer created an “a-HA!” moment for me. She made a great point: People are still people! There’s a PERSON on the other side of your Twitter direct message, Facebook message or reply to a new LinkedIn connection. Ok, on the surface, “duh” – you know that. But do you always ACT like you know that? Think of your online interactions in the context of a networking event. Would you walk into a networking event, quickly hand out a stack of business cards without having any meaningful conversations and then leave and hope to do business with those people? Hopefully not. The same is true for social: Just “connecting” with a bunch of people online without engaging them in meaningful conversations is VERY ineffective. Let’s look at what not to do and how to create meaningful relationships instead. Here’s the part of the gap where people tend to fall face first: THE PITCH. If you walk into an event and IMMEDIATELY pitch people when you meet them and only talk about yourself, you will put off everybody in the room. People do the online equivalent of that a lot. It’s that first reply, the all-important first impression, that can come across like this: “LET ME TELL YOU ABOUT ME! LET ME TELL YOU WHAT YOU CAN BUY FROM ME!” It’s not in all caps, that’s just what it can sound like in the other person’s mind when they read it. Start communicating around an article THEY shared through a “like” or comment. That will get their attention and isn’t that what you want? After your initial communication on their post, the door is open to follow up!! Brynne went on to say something that really resonated with me: “The biggest sin on LinkedIn is to connect and forget”. We all do it now and then, it is what it is. As sales people and business owners, one of our biggest issues is not following up with the right people at the right time. 1. Set up a phone call if appropriate – meaning you see a possible immediate opportunity for both of you. Share some insights or information that might be helpful to them – an article, a quote or a link to a resource in their industry. That way even if you don’t connect one on one with them immediately your first connection was valuable and that’s how they’ll remember you. Either one of those options are MUCH better than silence; I hope they help create some meaningful connections and opportunities for you! We’ve looked at how to find the right people and make that valuable first impression. In part II of this video interview with Brynne we’ll discuss what you can do after the connection is made so that the other person will WELCOME your call and WANT to talk to you when you reach out. HOW TO CONNECT WITH BRYNNE AND CREATE VALUE FOR BOTH OF YOU! If you are a sales leader with passion and purpose about what you do: Brynne loves helping with guest blogging and webinars; reach out about collaborating. If you know a passionate sales leader that’s interested in webinars or guest blogging for their team: Reach out to Brynne and introduce them.